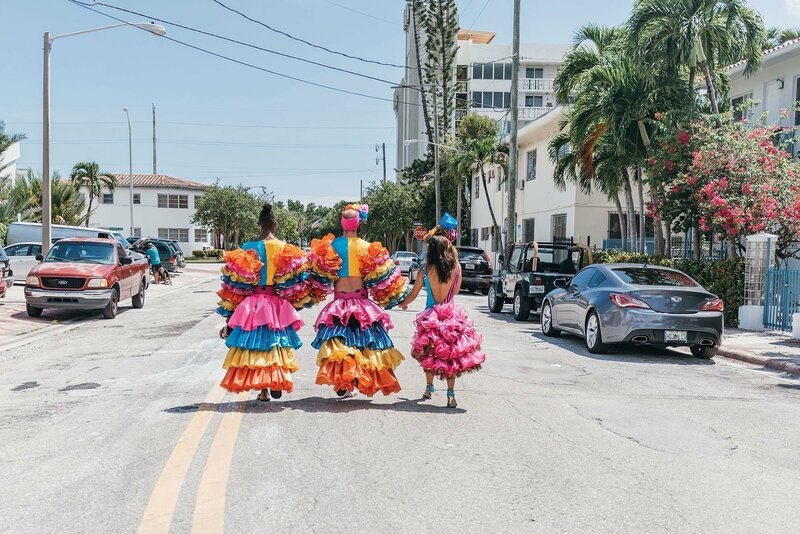 In my process as a choreo­grapher, usually the image comes first: a spinning white plate, an underwater queen, a weeping bounce house, spaghetti hair. When constructing and deconstructing that image in the studio, I practice a sort of radical presence encompassing my body, my spirit, and the image. I aim at breaking open the symbolism in a way that might reveal something about the human condition. That research recycles back into my body and distills into a kernel of physical information that I use as a psychic barometer to navigate a more lengthy research period. 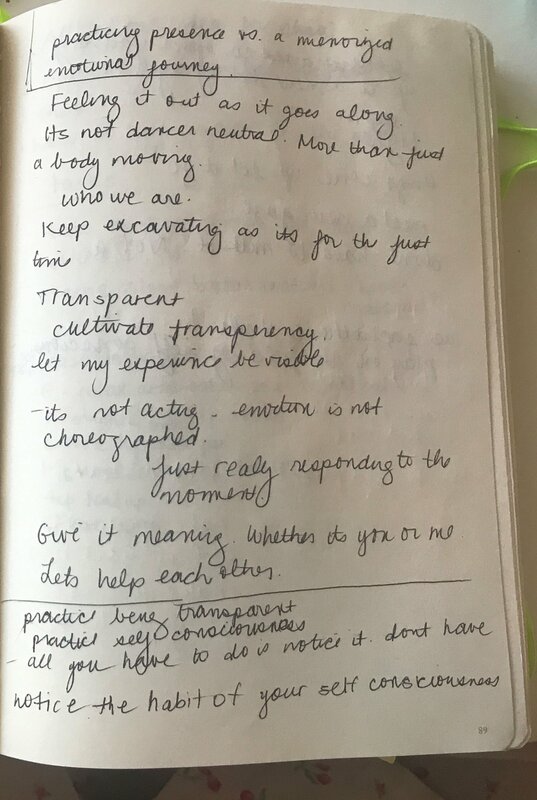 The more time I have in this state, the more I am able to articulate tasks that I feel will guide the dancers toward surrender. 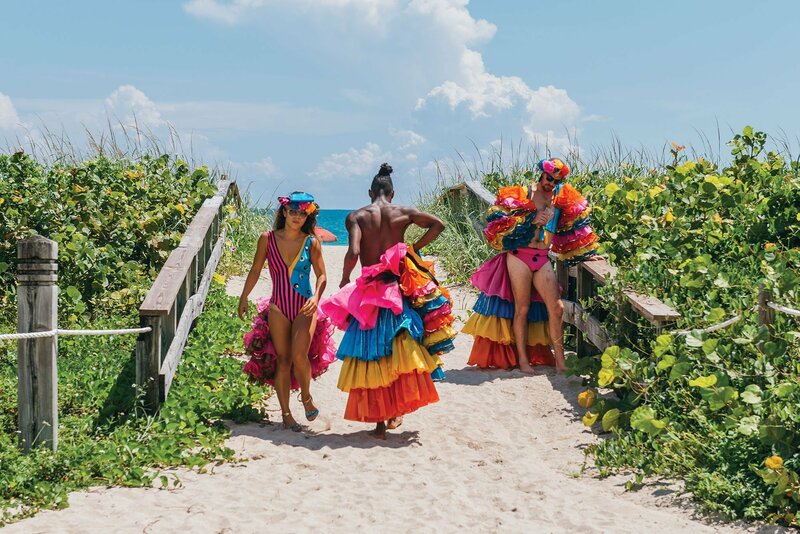 The photographs and notes shown here document this process through three works: Tropical Depression, a work in progress set to premiere in May 2019 at Miami Dade Live Arts; Carne Viva, first shown at the American Dance Festival (ADF) in 2016; and Make Believe, first shown at ADF in 2018. Although the aspects of my work people often remember most are the images, the presence and sensitivity of the bodies onstage remain the most potent sources of information about what is happening. As a dancer I am inherently surrealist, in a constant state of releasing the creative potential of my unconscious mind / body. I am interested in the limit­less expressive potential of every part of my body, and the clarity that comes from subtle prompting. Your knees are weeping. Your feet are laughing. Apologize for your hair. Simon Thomas-Train. 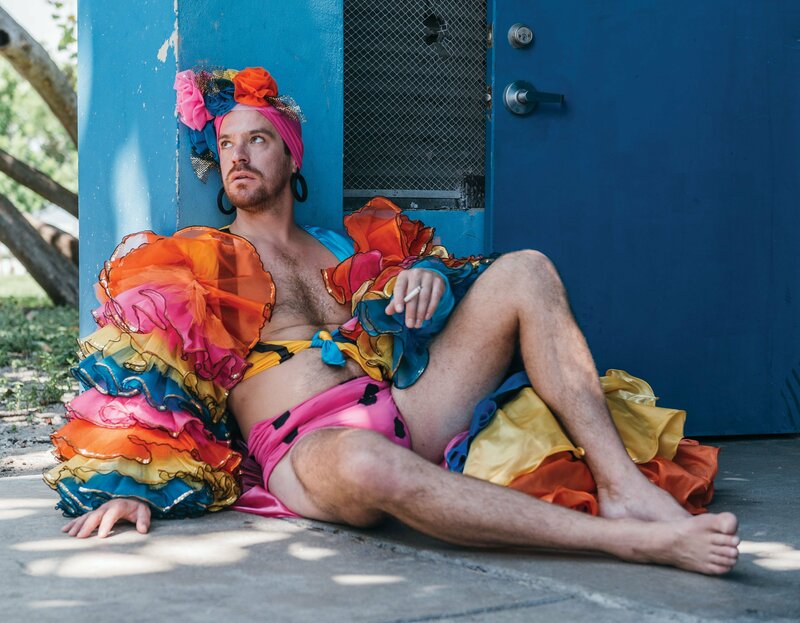 From Tropical Depression, 2018. Dancers Rayne James Raney, Simon Thomas-Train, and Britney Kerr Tokumoto, (left to right). You are bags of sugar that empty with each touch. Dancers Britney Kerr Tokumoto, Rayne James Raney, and Simon Thomas-Train (left to right). 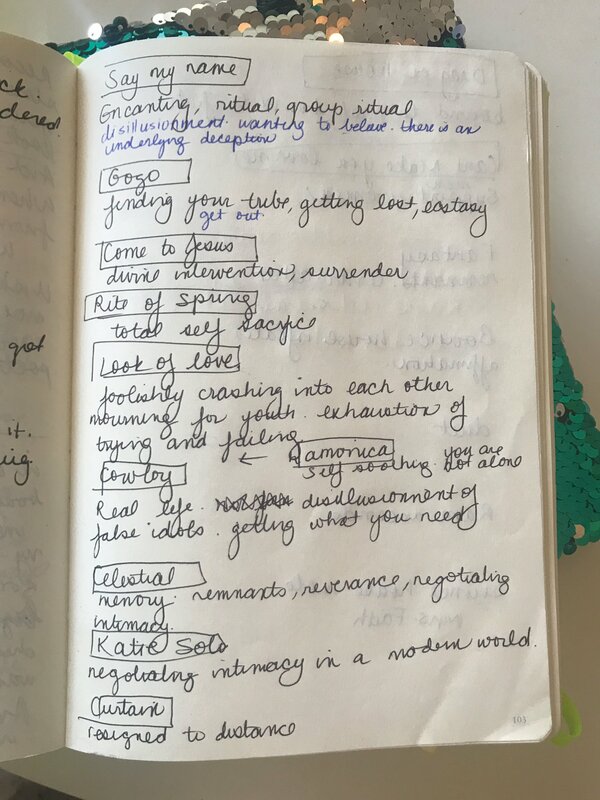 A page from the journal of Rosie Herrera with notes from the making of Make Believe, 2018. You are performing in a tiny burlesque show where the big reveal is your [insert body part here¬—knee, teeth, Adam’s apple]. You remove your voice to place it on an altar that is shifting in space. 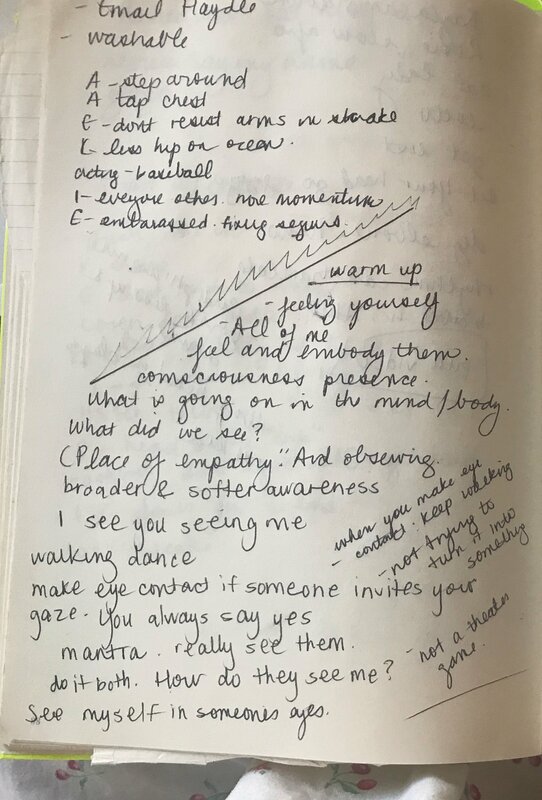 Pages from the journal of Rosie Herrera with notes from the making of Make Believe, taken while observing class with David Brick of Headlong Theater, 2018. You are two glasses of water that are slowly pouring into each other. Ivonne Batanero and Simon Thomas-Train. From Carne Viva, 2018. Your limbs are blades that you are using to dissect each other and remove each other’s organs. Edmundo Abel Berenguer and Elaine Wright. From Carne Viva. Your heart is a bell and you are ringing it.